In the ancient tomb paintings of the Nile Valley, Egypt's nobility often appears lithe, beautiful, and, above all, healthy. But researchers have long doubted that life at the top of the social pyramid in ancient Egypt was quite so rosy. At least as early as 1500 B.C.E., Egyptian physicians observed symptoms of angina, heart attacks, and congestive heart failure in patients and recorded them in medical papyri. Yet they gave little indication of how often they saw such cases. Now a team led by cardiologists Adel Allam of the Al Azhar Medical School in Cairo and Gregory Thomas of the University of California, Irvine, has conducted the broadest and most detailed study yet of atherosclerosis—a hardening of the arteries that causes both strokes and heart attacks—among ancient Egypt's upper classes by building on earlier work and performing CT scans on 52 of their mummies. In a study presented at the scientific session of the American College of Cardiology today in New Orleans, the team found that 44 of the mummies still possessed identifiable cardiovascular tissue, and of these 45% exhibited definite or probable hardening of the arteries. "We were a bit surprised by how just how much atherosclerosis we found on ancient Egyptians who were young," says team member James Sutherland, a radiologist at the South Coast Radiological Medical Group in Laguna Hills, California. "The average age of death was around 40." Researchers have long known that factors as such as smoking, a genetic predisposition to early heart disease, a calorie-rich diet, and a lifestyle lacking in exercise all increase the risk of atherosclerosis today. But how prevalent were these factors in ancient Egypt? According to ancient hieroglyphic inscriptions, wealthy ancient Egyptians relished such calorie-rich fare as cakes sweetened with honey. But they did not smoke tobacco and, in an age before automobiles, they likely got more exercise than many of us do today. "So we think there must be other risk factors that we are missing," says Thomas. One such risk might have been a high exposure to bacterial infection and infectious disease. Parasitic diseases such as malaria and schistosomiasis are endemic in the Nile Valley, and the ancient Egyptians had little means of treating them. "So all that infection might have really revved up the [ancient Egyptians'] inflammatory response," says team member Michael Miyamoto, a cardiologist at the Mission Internal Medical Group in Mission Viejo, California. Inflammation helps to remove the agents of infection and promote healing, but older individuals may have paid a steep price for it: high levels of inflammatory response can contribute to the development of atherosclerosis. The team now plans to test this hypothesis. 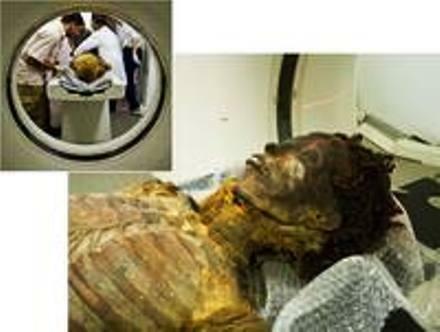 Since microscopic signs of inflammation might well be absent from ancient, desiccated tissue, the researchers intend to look for indirect evidence of inflammation by examining CT scans of the mummies for the extent of chronic infections, such as bone infections or periodontal disease. Guido Lombardi, a mummy researcher and paleopathologist at Cayetano Heredia University in Lima, Peru, is impressed by the study. "The team found mummies that were intact, with arteries that were readily identifiable. … I have no doubt that [their diagnoses] are right," he says. Moreover, Frank Rühli, an anatomist at the Centre for Evolutionary Medicine at the University of Zurich and the co-director of the Swiss Mummy Project, which is examining mummies in Swiss collections by medical imaging, is intrigued by the team's hypothesis that high inflammation levels may have posed a major risk for vascular disease in ancient Egypt. "I think the whole issue now is to find out what the risk factors were and how they changed over time," he says.